MaMa busted out her slow cooker again...I think it might just be her favorite kitchen gadget! This time she made breakfast overnight using our Cracked Wheat Breakfast Cereal. It was piping hot and waiting for us when we woke up! 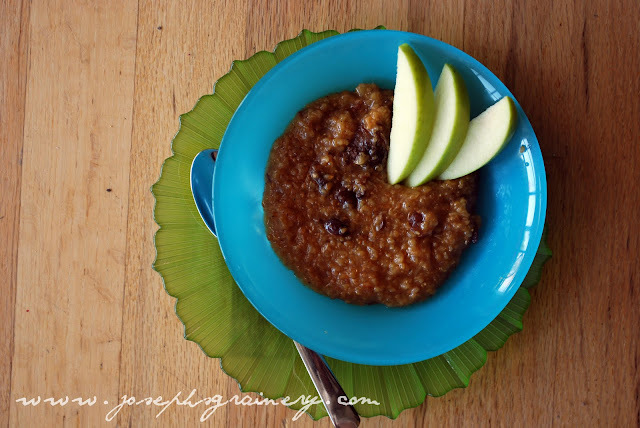 What's better than having breakfast waiting for you - Cracked Wheat Apple Cranberry Cereal. Directions: Place all ingredients in your slow cooker and set on low heat. Allow to cook over night. In the morning, depending on your crock pot, there might be a film over the top of the cereal, remove and dispose of it, then dish up the cereal and garnish with a few apple slices for a nice healthy start to your day!